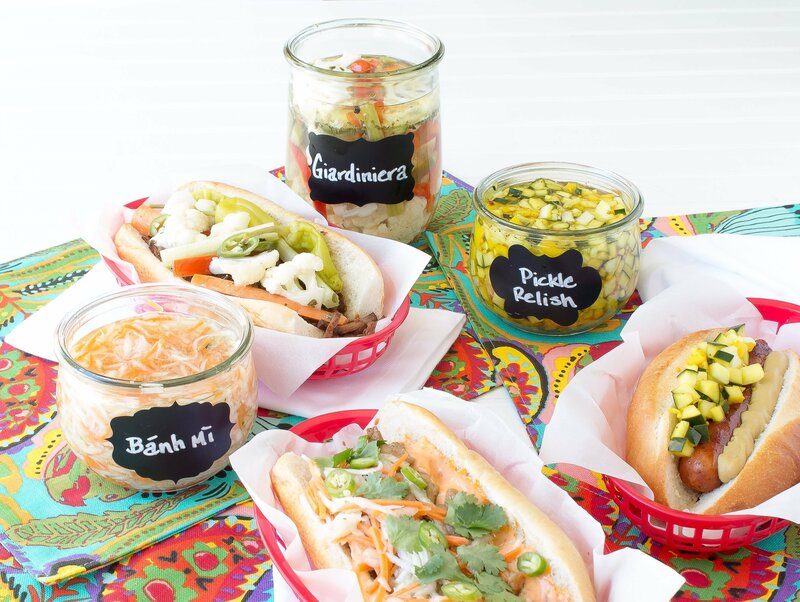 Your favorite sandwich will never be the same once you dress it up with my Spicy Garlic Quick Pickles packed full of garlic flavor with a real kick. This weekend visit your local farmers market for the fresh ingredients you need to make this favorite summer treat. 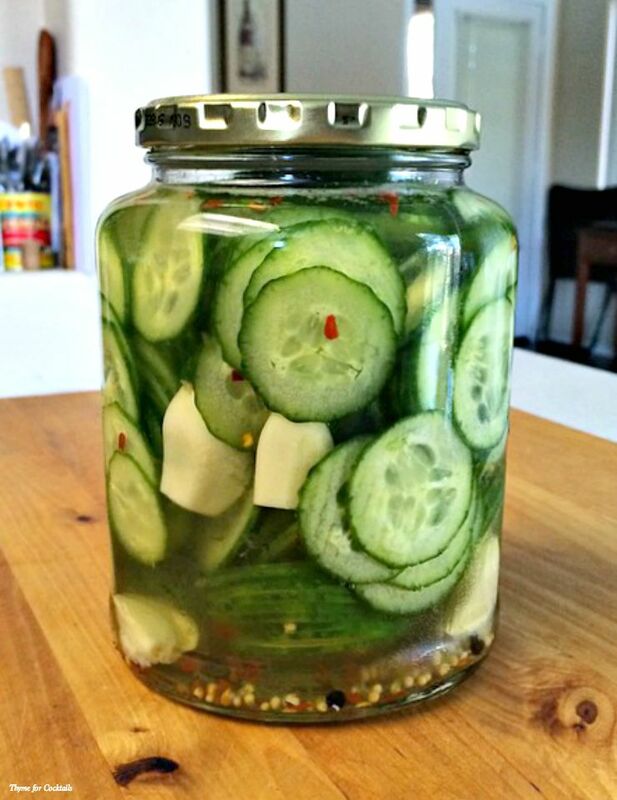 Cucumbers are in season so I have been pickling up a storm lately. 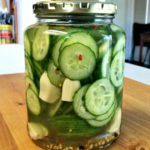 One of my favorite local farms in Arizona, On the Vine Farms, has the best pickling cukes. Those crispy green beauties just keep showing up in my farmers market basket each weekend. Pickles are by far one of my favorite snacks so it works for us. I make a variety of different types of pickles but these Spicy Garlic Quick Pickles are by far a casa favorite. The bestie and I developed this recipe months ago on one of our wine-Mondays. Homemade pickles with lots of garlic, red pepper flake, black peppercorns and mustard seed. Pack cucumbers into 2 16-ounce jars. Divide garlic, peppercorns, mustard seed and red pepper flake equally between jars. In a small saucepan add water, vinegar, sugar and salt. Bring to a low boil, cook until sugar dissolves. Pour brine into each jar until veggies are covered. Cool, cover and store in the refrigerator. Pickles will be ready in 1-2 hours. These look fabulous! I love pickles! Wasn’t impressed. Very watery, vinegary, and just, meh. If it looks too good to be true…..
Frank, I am sorry you didn’t like them. Pickles are a pretty personal thing. What would you do differently? For a fresher crisper spin… I’m adding 1T Dill Seed. Wish me luck!! Keep up the great work, Casa Bustos!! ¡Andale! Gracias mi amigo! Dill is an excellent addition to this recipe. In fact I just picked some up myself last weekend and made a medley of pickled veggies. Carrots, celery, cauliflower, etc. Great for a brat or Bloody Mary topping! You should add jalapeno too! Giving this a shot….added the dill and jalapeño per the suggestions above. Will let you know.